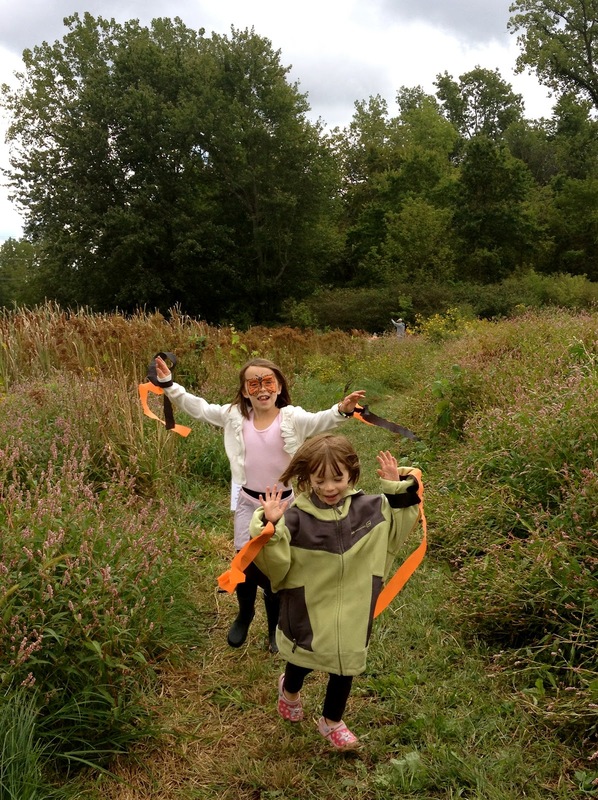 This weekend, we went to the Eagle Marsh Monarch Butterfly Festival. It was a fun festival, with great activities for the children and a very well thought-out schedule of events surrounding the sustainability of our ecosystem, with a focus on the lovely butterfly. It was a beautiful day on the marsh. The girls got into the spirit of things, adorned with their butterfly wings. For some reason, getting your face painted never gets old. We even spotted a few monarchs. Some strange woman turned my babies into chrysalises. Finally, the butterflies reached their destination: Mexico. Baby butterfly got tired of walking. Later, there was West Central Art Fair craziness. Laura was going to try the gourmet hot dogs by Bravas for the first time, but when we got there, they were sold out of the guacamole, their chili sauce, and their specialty Bravas sauce. Instead, we got the girls each a plain hot dog with ketchup and it was a damn travesty. Especially since little miss vegetarian Fiona only ate the bun. The Beard and Mustache Society, a philanthropic group, were giving out free mustaches. You can find out more about this group by searching for them on Facebook. When we headed home after the art fest, we talked about how nice it would be to live in such a close-knit community, which the West Central inhabitants seem to enjoy. There's a sense of solidarity. A feeling of belonging. Then, we came to our senses, acknowledging that we really want to be hermits on a 50-acre farm, raising chickens, growing vegetables, and making goat cheese. Sunday, we spruced up our landscaping, planting some more butterfly food. It's our current life theme. Fostering beauty and flight. Fiona and Cyd decided to start a worm colony. I overheard Fiona tell Cyd: "Let's teach them how to fly!" Cyd was totally on board: "OK!! Fly, little worm!" Perhaps they were a little too carried away with the life of caterpillars and butterflies. But I never question their quests. You just never KNOW. Fiona helped me make what Nigella Lawson calls "Lunchbox Treats". It's kind of like a Rice Krispies treat, except without the dreaded marshmallow. 4. Let them set in the fridge for an hour or so and enjoy! They turned out just fine, despite our rebellious revisions to the recipe. When Cyd woke up from her nap on Sunday, she said, "Maman, you know what I want you to make for dinner? The french soup that I LOVE!" It was 5:30 p.m. by then, and I had already been simmering my french onion soup for a while. Because we're as PREDICTABLE AS DEATH, that's why. And if you're going to be in a rut, it might as well be a french onion soup rut.